A PowerPoint presentation can be a fantastic audio visual tool for many purposes, from giving educational lectures to running business meetings and hosting conferences or other such events. However despite being designed to be intuitive and easy to use, there are a few mistakes that many over enthusiastic PowerPoint users tend to fall into. 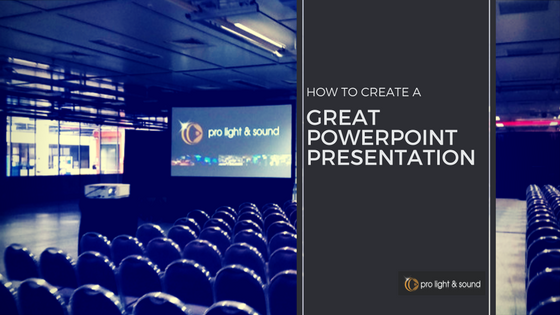 To help you avoid these issues and ensure you put together the best presentation possible, we have put together a quick guide to assembling a fun, clean and easy to follow PowerPoint that your guests are sure to love. Visit any graphic design or advertising firm in the country and you are fairly likely to run into this mantra, and there’s a good reason for that. Simple, spacious designs are much easier on the eyes and more enjoyable to follow than overly complicated layouts with too much text or images. For that reason, you will want to keep your PowerPoint as simple as possible. Ensure there is plenty of open space and that you are only putting the most essential information in your presentation. A common mistake made by amateur PowerPoint builders is to try and include their entire speech inside the presentation, with the thinking that people will have an easier time following your message if you do so. This is a big mistake, as it makes your PowerPoint appear cluttered and overly complicated. People are far more likely to zone out and stop paying attention when confronted with big blocks of text, so it’s important just to include the key bullet points inside your visual presentation. Many people who are new to PowerPoint find themselves getting carried away with the myriad of different graphics and transition options available. Not only does this mean your PowerPoint will take longer to build, it will also make it more likely that your viewers get distracted or confused during your presentation. It’s important to remember that the main focus point of your PowerPoint should be your message, and that your viewers are far more likely to remain engaged and focussed if you keep things nice and basic. Often, when creating a new PowerPoint presentation users try to make their points stand out by using different fonts and highlight their points by using formats like Bold, Italics and Underlined plus using ALL CAPS. Having to many variations in the copy can look messy. So, as a rule of thumb stick to no more than 2 fonts throughout your presentation and only use other formatting when it is grammatically correct to do so. Such as using Italics when adding a “quote”. As the foremost experts in audio visual equipment and event lighting in Victoria, Pro Light & Sound can provide you with the tools you need to deliver a professional and streamlined presentation every time.